March 28, 2017 By This post may contain affiliate links. These darling Reese’s Hatching Chicks will bring smiles to everyone who see’s them. 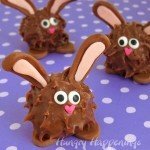 Made from Yellow Reese’s Peanut Butter Cup Eggs, these Easter treats could not be any cuter. I mean, seriously! Look at those big eyes and fluffy feathers sticking up from their heads. Did you say, “awe” when you saw them? 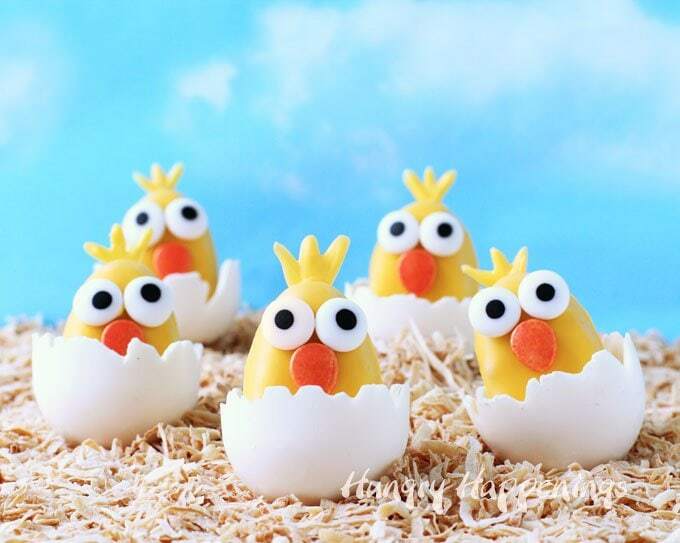 Each time I showed these sweet little Easter chocolates to a friend, she would let out a big sigh and either squeal or say a big long, “awwwwwwwwwwwwwwe.” I know these sweet little chocolate baby chicks will get the same reaction if you share them with your friends and family. The trick to making them look so incredibly cute is to use 1/2 inch candy eyes. When I was designing these sweet Easter treats I put smaller and even larger eyes on them and the 1/2 inch royal icing eyes definitely got the best reaction. You will not be able to buy 1/2 inch eyes at the craft stores, unfortunately. 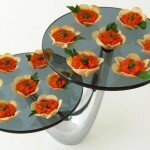 You will either have to go to a cake & candy decorating shop or order them online. 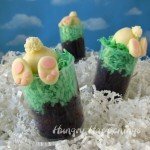 These fun little Easter treats are so easy to make using Yellow Reese’s Peanut Butter Eggs. Did you know that Reese’s now makes yellow eggs? They must have known all of us food craft bloggers would use them to make chicks. As soon as I spotted them I knew that’s how I’d use them. 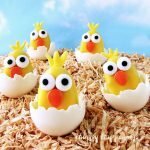 Before I had a chance to get my Reese’s Hatching Chicks made a few other creative bloggers made their own version of the sweet chicks. Check out the lollipops by I Heart Naptime, the cupcakes by Lil Luna, and the no-bake Easter nest cookies by Inside Bru Crew Life. 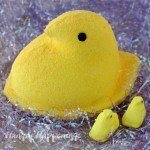 There are so many ways to turn the yellow Reese’s Eggs into cute chicks. 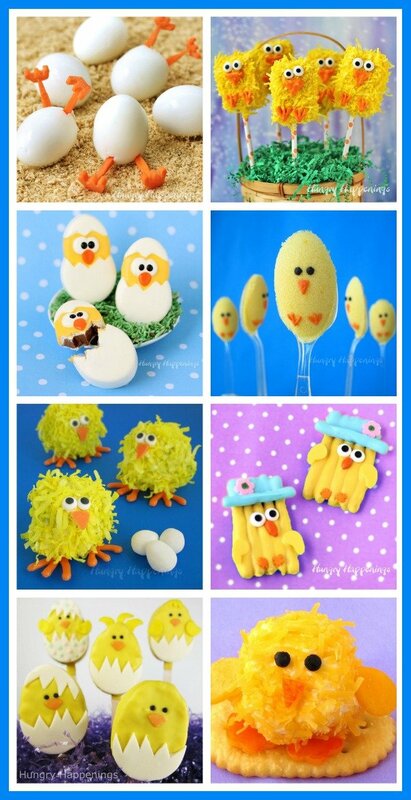 To decorate my chicks I added orange Wilton Easter Egg Sprinkle beaks along with the candy eyes. I found the small egg shaped sprinkles at Kroger and they are also available, for now at least, on amazon. If you can’t find them you can cut orange gumdrops, orange circus peanuts, or a taffy candy like a Starburst, into beaks or use smaller candy coated sunflowers seeds. 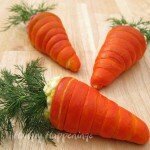 You could also make them using candy clay. To make the egg shells for the hatching chicks I used a small 2 1/2 inch plastic Easter egg. They are the traditional size eggs you can find at any store during Easter. Just make sure the inside of the plastic egg is nice and smooth. If it has ridge lines they will show on your chocolate eggs. I was planning to add these Reese’s Hatching Chicks to cupcakes, but when they were all done, I thought they were perfect all on their own. I just snuggled them in some toasted coconut to make them look as though they are sitting on hay. I love to set up scenes when I take my photos so I added a blue sky paper behind the chicks and snapped my pictures. 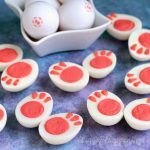 Be sure to add two coats of candy melts when making the egg shells. Paint the shells so that the edge looks like a cracked egg. Only freeze the egg shells for a minute or two. If they are chilled for too long they might crack. You want the eggs to sit upright while in the freezer as the candy melts will pool in the bottom which will help hold your hatching chicks upright later on. If your eggs fall over the candy will pool on the side of the egg and you’ll have eggs that won’t stand up straight. I set my eggs in between the wire grid in my freezer. You can use an egg carton to hold them upright as well. When you take the shells out of the freezer and spoon the white candy melts into the candy egg shell be sure the candy melts are not too hot as it can melt the candy shell. Allow that candy to thicken enough that when you add the yellow Reese’s Egg Chick that it holds in place. If you allow the candy melts to cool to between 92 and 98 degrees, you can pour it into the egg shell and almost immediately add your Reese’s Cup Chick. Be careful when handling the eggs as the feathers on their heads are very delicate and break easily. To make these Reese’s Hatching Chicks you’ll need these supplies that you can find on Amazon (commission earned for sales). Turn yellow Reese's Cup Eggs into adorable little chicks then nestle them in candy egg shells. Unwrap the Yellow Reese's Eggs. Pipe little feathers using yellow candy melts onto a parchment paper lined baking sheet and immediately attach a Reese's egg. Add 3 dots of yellow candy melts to the egg and attach two candy eyes and one beak. Freeze for a minute or so just until the candy feathers harden. Carefully peel the chicks off the parchment paper. Pour a spoonful of white candy melts into the smaller half of a plastic egg. Brush the candy coating up the sides of the egg painting the top edge so it's jagged. Freeze upright for 1 1/2 minutes then remove and let sit at room temperature for a few minutes. Pour another small spoonful of candy melts into the egg and brush it up the sides adding a second coat. Freeze for another 2 minutes then remove and gently tug on the candy. If the candy shell releases easily then pull it out. If not, freeze for another minute then try again. Repeat making a total of 12 egg shells. Set the shells upright and spoon in about a teaspoon of white candy melts. Let that candy thicken slightly then set a chick upright in the center. Hold the chick in place until it stands upright on it's own. Arrange on a serving platter and sprinkle toasted coconut around the chicks, if desired. Funny how you can give the same ingredients to several people and they’ll all come up with their own unique version of the same thing. Reese’s knew what they were doing when they made these eggs. I like your version in particular as the cracked egg stands “away” from the chick which makes it look so realistic. Have to let you know that your cheese chicks have been a favorite of mine for a long time now. I am always excited to see what new treat you come up with, these are for sure one of my favorites! I was squealing over here too! I’ll try not to gush..but..never mind, I’m gonna gush. These are over-the-top CUTE and I LOVE them!! I did not know there were yellow Reese’s eggs and I can’t wait to go to Wal-mart tomorrow to find my own. Your Easter chicks belong on a magazine cover! Awe, that is so sweet of you!! 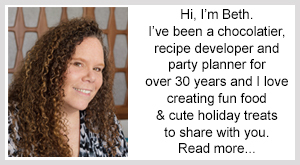 I know you are going to make something super creative using the Yellow Reese’s Eggs. Have a wonderful Easter!! !